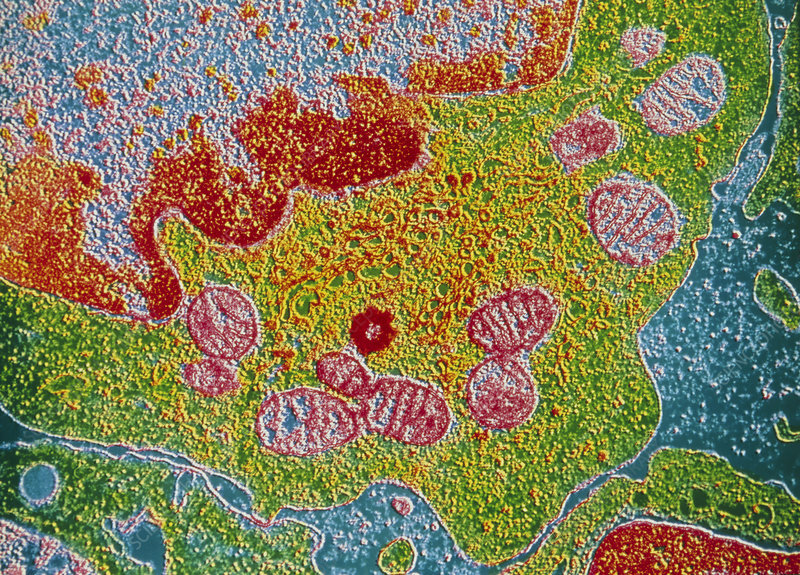 False colour transmission electron micrograph of a human lymphocyte (white blood cell), showing details of the cell's ultrastructure. The nucleus appears blue & red at top left; the red areas towards the inside of the nuclear envelope represent heterochromatin - nuclear genetic material. Numerous mitochondria (pink) are dissipated throughout the cytoplasm (green); these are responsible for chemical energy synthesis within the cell. The dark red circular feature is a centriole, which is involved in the formation of the mitotic apparatus (spindle) at the time of cell division. Magnification: X 6000 at 35mm size.